We can lift pallets and crates of building materials and land them in a wide variety of sites. Next to the truck is most basic but we can reach up to 69' away over an open excavation, into a garage door or sometimes through a doorway. We've lifted building materials to a brownstone front door as they were too heavy to carry up. Crates onto sidewalk bridgework or steel beams into 5th floor windows. The freight elevator isn't always big enough! KST can not only bring the material but also the equipment to unload ourselves where you need it. No need to hire a second piece of equipment and operator to offload. You'll also hope everyone gets to the job at the same time and there is enough room to park in the city. KST can do it all with one truck and operator. Weight Capability – The boom capacity can lift up to 10,000 lbs. The truck capacity is 14,000 to 30,000 lbs. 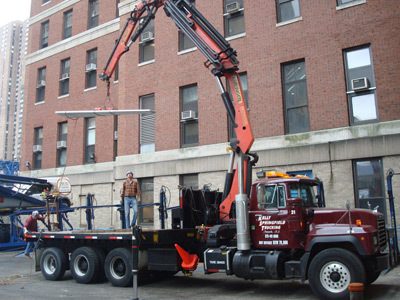 Care – We offer airride on one of our boom trucks for special items. Out of the city our boom trucks have 4,000 pounds of winching capability. Kelly Springfield Trucking’s boom trucks service New York, New Jersey, Connecticut, and Pennsylvania metro areas and can be used by distributors, contractors, business and homeowner too. We’re centrally located in Newark, New Jersey and can be reached by phone at 908-862-5215 or email us at info@kellyspringfield.com. The next time you have some heavy lifting give us a call – your back will thank you.